Chicken is a great source of protein that’s highly bioavailable but also lean and low in fat. If you’re training for an athletic or sporting event, or if you’re trying to build lean muscle, then there are few better meals than lean chicken. At the same time it’s also delicious and very quick and cheap to prepare when compared to other meats like pork or beef. However despite its many benefits it is also highly important that your chicken be properly cooked, and if it isn’t it can potentially be a course of illness and actually very dangerous. 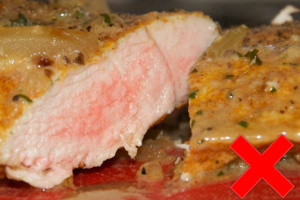 Unfortunately white meat is much more likely to contain bacteria. This means pork to a degree, but chicken is arguably the main culprit being infected with salmonella, campylobacter and many other kinds of bacteria in many cases. In fact in a study examining 382 samples of chicken (purchased from one hundred different food stores) it was found that only 34% of those birds were completely free of disease and bacteria. The bad news is that it only takes a single drop of raw chicken juices to pass on an illness and that means it can be spread by things like cutting boards and knives. The good news however is that it is relatively simple to kill any bacteria that might be infesting your chicken and at the same time most people will also recover from salmonella etc. without lasting damage. That said it’s still very important to take care. Following are some precautions you can take. To kill off ay bacteria you should aim to cook your meat at around 168 degrees Fahrenheit and all the way through so that the middle reaches those temperatures too. Read the guidelines on the packaging and make sure to take the weight into account. If in doubt just cook it a bit longer – it’s always preferable to overcook your chicken rather than to undercook it – the worst that can happen in the latter case is that it’s a little bit tough and dry. Make sure that you check the state of your chicken by cutting through it to ensure that the middle is white (rather than just the outside), and make sure that the juices that come from it are clear rather than pink or red as well. You should also make sure that you choose your chicken wisely – make sure it is from a free range farm and be willing to pay a bit more for a better quality cut of meat. Bacteria are more likely to be a problem on cheap chicken that was kept in a cage. You must also ensure that your chicken is in date and that it looks like it’s in good condition (be weary of brown or stringy looking chicken). After you have prepared your chicken make sure to immediately wash up everything that came into contact with it – which includes chopping boards, knives and of course your own hands. You also need to think about the condition of chicken that you eat out. Be wary when eating out and inspect the quality of the venue before choosing your order – is the food sealed? Was it prepared on a clean surface? Check over all your food as well before eating it – and don’t worry about ‘looking rude’ because your health is much more important than your reputation. Good article, watch those spelling errors!